Lots of things happening that CBA North Followers might want to be involved in – as well as the regular archaeological events – this week alone. 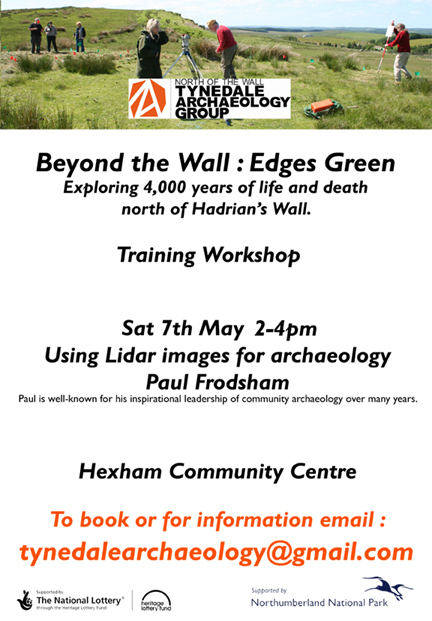 Tomorrow there are a pair of events for the Peregrini project as “An introduction to methods of archaeological practice” from 11am to 3pm at the Belford Community Club, West Street, NE70 7QE and there will also be a guided walk of the Green Shiel site on Lindisfarne led by Dr Rob Young, one of the excavators of the site. For details of both these events and to a book a place you should email Marc Johnstone at lindisfarne@archaeologicalpractice.co.uk as soon as possible. On Wednesday is the TILLVAS talk on “Whaling in the North-East” by Dr Tony Barrow. On Thursday there is a reception for members of the Architectural and Archaeological Society of Durham and Northumberland, and those of the St Mary-le-Bow Trust, when the opening is carried out of a new exhibition at the Durham Museum and Heritage Centre, St Mary-le-Bow, which showcases the history and work of the Architectural and Archaeological Society of Durham and Northumberland, including information and finds from their excavations at Hornby Castle, near Catterick, in North Yorkshire. All ‘Arch and Arch’ Society members and members of the St Mary-le-Bow Trust are invited to the opening on Thursday 5 May at 7.00pm. 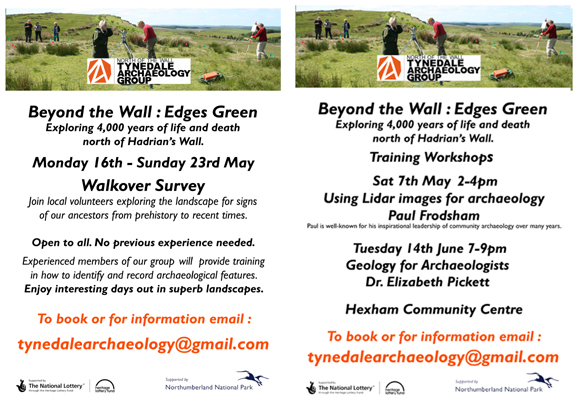 Tynedale Archaeology have sent us their poster for an event this Saturday. Their further events include May fieldwork and a June workshop as below. If you would like to get involved please contact them direct. The next lecture in this series will be on Monday, 9 May, at 6pm, in Room PG20, Pemberton Building, Palace Green Library, Durham, but you will need to book this week to attend. This will be by Anna Brennand, Chief Executive at the Ironbridge Gorge Museum Trust, who will be speaking on “Ironbridge Gorge World Heritage Site: the Challenges of the Last 30 Years and the Opportunities for the Future”. The poster for the lecture is attached here. This lecture discusses the challenges faced by the Ironbridge Gorge World Heritage Site and explain the opportunities these present for protecting its outstanding universal value, as the Site celebrates its 30 years designation – which, of course, Durham does this year as well. The lecture will be followed by a drinks reception at the World Heritage Site Visitor Centre. The lecture is free of charge. However, as places are limited, booking is necessary. Please reserve your place by writing to the organiser at raffaella.aliprandi@durham.ac.uk or contact the World Heritage Site Visitor Centre on 0191 334 3805. This entry was posted in E Newsletter and tagged AASDN, Durham, Peregrini, TillVAS, Tynedale Archaeology, WHS on May 3, 2016 by cbanorth. I am very pleased to announce that the Durham Castle and Cathedral World Heritage Site Management Plan draft version is now live for public consultation. This is a very important part of the process of ensuring that our new plan is relevant and useful – your comments are important to us. Please click on this link https://www.durhamworldheritagesite.com/management-plan which will take you to our home page where you can find out all about the different ways you can comment on and contribute to the plan. If you have any problems accessing our site, please don’t hesitate to contact me. Also, please do feel free to forward this message to any colleagues you feel would be interested in the Management Plan. This entry was posted in Consultations, E Newsletter and tagged castle, Cathedral, Durham, WHS on March 5, 2016 by cbanorth. This is just a reminder that the next Teesside Archaeological Society lecture will take place on Tuesday 23rd Feb 7.30 at Stockton Central Library. Writing under the pen name David Willem, David is the author of ‘St Cuthbert’s Corpse – a life after death’. In this talk, David will draw upon research for this book, charting the history of St. Cuthbert’s body through time. His coffin was opened six times in 1300 years and on each occasion someone kept a record of the body and relics as they were found – Anglo-Saxon monks, the first kings of all England, the Normans, Henry VIII’s henchman, a Georgian antiquarian and Victorian scholars – all bringing different preoccupations and concerns to the same body of material. Anyone can come along and it is only £4.00 for non-members. If you would like to join and you haven’t joined for this year, it is £14.00 for a single membership and £23.00 for a joint! That will cover you this year on fieldwork, all the lectures and the annual bulletin which is now ready for you all! This entry was posted in E Newsletter and tagged AONB, Cathedral, chester-le-street, Durham, Early Medieval, Lindisfarne, TAS, WHS on February 21, 2016 by cbanorth. Please find below the details of our Architecture and Conservation Series lecture for October. I very much hope you will be able to attend. Among the first group of designations in Britain were Durham and the Ironbridge Gorge, the latter being the first industrial site in a country that set in train the Industrial Revolution which heralded the modern world. David de Haan, one of the retired Directors at the Ironbridge Gorge Museum, will look at the World Heritage Site, what was there and how the area was restored. The lecture will present the history, the decline and dereliction that preceded the restoration, and the interpretation and conservation that made possible the WHS nomination. It will also look at the management issues and the visitor profile so that parallels can be drawn. David is a museum professional with 45 years’ experience, including 8 years at the Science Museum in London and 34 at the Ironbridge Gorge Museum Trust, where he still works as a volunteer. He managed the Ironbridge Institute’s Heritage Management programme from 1998 and the Museums Management programme from 2001 until his retirement in 2012. He was also responsible for the restoration, interpretation and management of many of the museum sites in Ironbridge. A past Fellow of the Museums Association, past Council Member of the Newcomen Society, and Honorary Secretary of the Association for Industrial Archaeology, David is an acknowledged expert on the Iron Bridge, the 1851 Exhibition and the Art of the Industrial Revolution. The talk will be followed by a drinks reception in the World Heritage Site Visitor Centre. Please book your place by writing to Raffaella Aliprandi at raffaella.aliprandi@durham.ac.uk. Would you also let me know whether or not you will be attending the reception afterwards, for catering purposes. Please don’t forget to circulate this email to whoever you think might be interested. This entry was posted in E Newsletter and tagged Consultation, Durham, Durham University, Heritage, Museum, WHS, World Heritage Site on October 10, 2015 by cbanorth. Please find below the details of our Architecture and Conservation Series lecture for September. Heritage assets including historic buildings have their own intrinsic value or significance, and understanding that significance is crucial to informing their reuse, adaption or extension to meet 21st century needs. This talk will highlight examples where significance has delivered the unexpected, confirmed designs or inspired new ones. It will show how it can help to breathe new life into old buildings and their wider environs. Caroline Hardie is a local heritage consultant with Archaeo-Environment, which she founded in 2003. She provides high quality planning advice on all aspects of the historic environment and prepares Conservation Management Plans, Statements of Significance, Heritage Assessments and Conservation Area Appraisals throughout the UK. She has also worked on historic landscape characterisation, ancient monuments protection and the current Lake District National Park bid for World Heritage Status. Prior to her work in the private sector she was the Head of Conservation and the County Archaeologist for Northumberland County Council. She is a Member of the Institute of Historic Building Conservation and a Member of the Chartered Institute for Archaeologists. The talk will be followed by a drinks reception in the World Heritage Site Centre. This entry was posted in E Newsletter and tagged Consultation, Durham, Durham University, Heritage, WHS, World Heritage Site on September 11, 2015 by cbanorth. The lecture is aimed at stimulating discussion from the audience about an admittedly controversial subject. The offer to speak personally was made in response to feedback comments of some of last year’s student attendees of the lectures who requested more practitioner and planning decision making perspectives. The presentation draws on types of scenarios reflecting recent and current challenges and real or perceived opinions on ‘sustainability’. It will highlight sometimes conflicting expectations and some of the differing perspectives and legal obligations of those who interact and play a part in influencing the character and experience of our living, working and changing Durham WHS. With a natural interest in human geography and environmental design and a strong link with the urban landscape of her native North East, Sandra has held Consultant or Senior Planning Officer positions for most of her career, largely dealing with planning applications at Tyne and Wear Development Corporation, Gateshead MBC, Tynedale District Council and Durham County Council. Between 2009 and 2014 Sandra held specialist management roles culminating in Heritage, Landscape and Design Team Leader in the Planning and Assets service. She has stepped down from that fulltime role now and is in a time limited part time singular role for specific projects. Since 2005 Sandra has also run a Sole Practitioner Consultancy, where she has worked on specific commissions and problematic cases, such as the Cockermouth Conservation Area Appraisal, the “Heritage at Risk” development challenges for Axwell Hall andcommunity led high street regeneration in Gateshead, and the funding application and planning permission for expansion for Hartlepool Hospice. PLEASE NOTE THAT PLACES FOR THIS LECTURE ARE LIMITED. Please book your place by writing to Raffaella Aliprandi atraffaella.aliprandi@durham.ac.uk. Would you also let me know whether or not you will be attending the reception afterwards, for catering purposes. The following lecture in the series will take place on Friday 19th June 2015, 6.00pm. More details will follow near the time. This entry was posted in E Newsletter and tagged Durham, Gateshead, Hartlepool, Planning, WHS, World Heritage Site on April 10, 2015 by cbanorth.